Owners didn’t want to play it safe when they designed their dreamy family home. 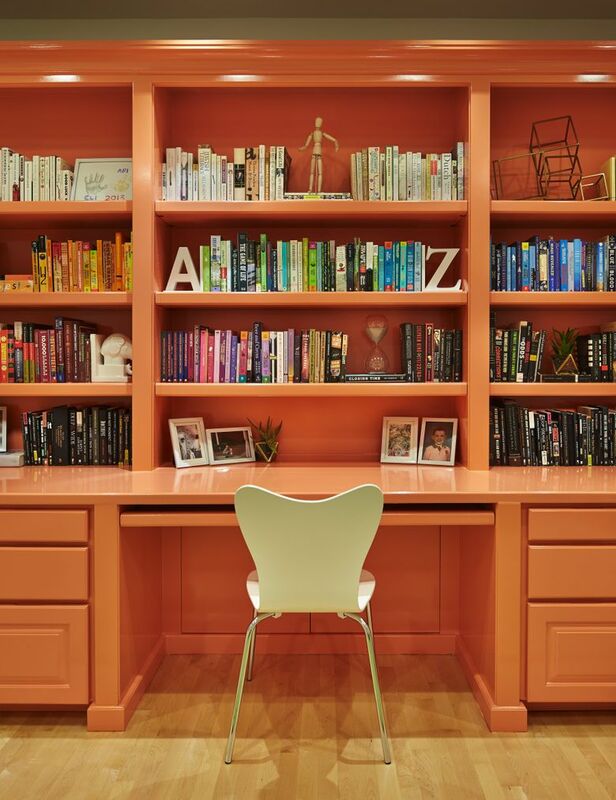 TO GET TO KNOW her new client, interior designer Kim Gorsline gave Amanda a color-profile test. Amanda passed. With, ah-hem, flying colors. 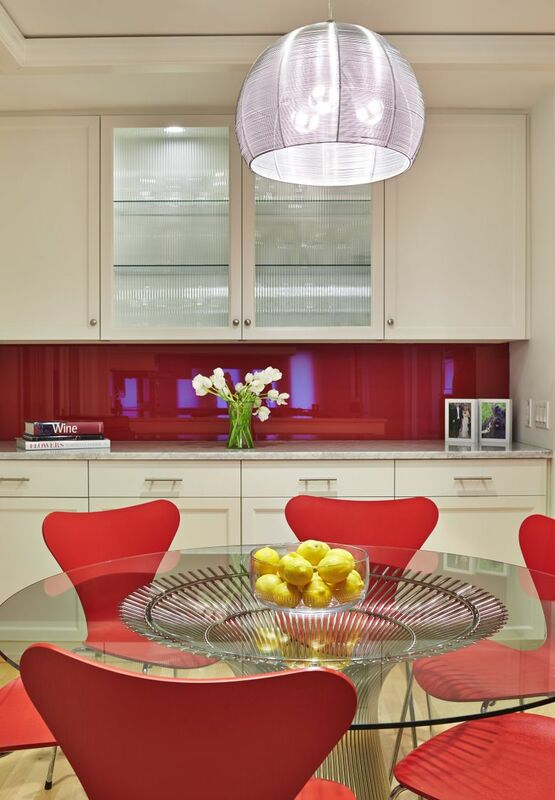 “Red is my favorite,” she says, referring, specifically, to the glass-painted backsplash in the kitchen and dining-room portions of her family’s Mercer Island home, a well-curated rainbow of contemporary design. This shade, in particular, recalls a fat tomato at its most ripe. With Gorsline by her side, Amanda did no such thing. (Today she’s wearing a simple black dress and a large watch with the color wheel across its face.) They hunted and gathered from Room & Board, West Elm, Roche Bobois, Design Within Reach, Seva Home, the Seattle Design Center and more. The family arrived in the Seattle area eight years ago from Chicago for a change of lifestyle. But two is now five — they have three boys under 6 years old — and the family needed a family home. 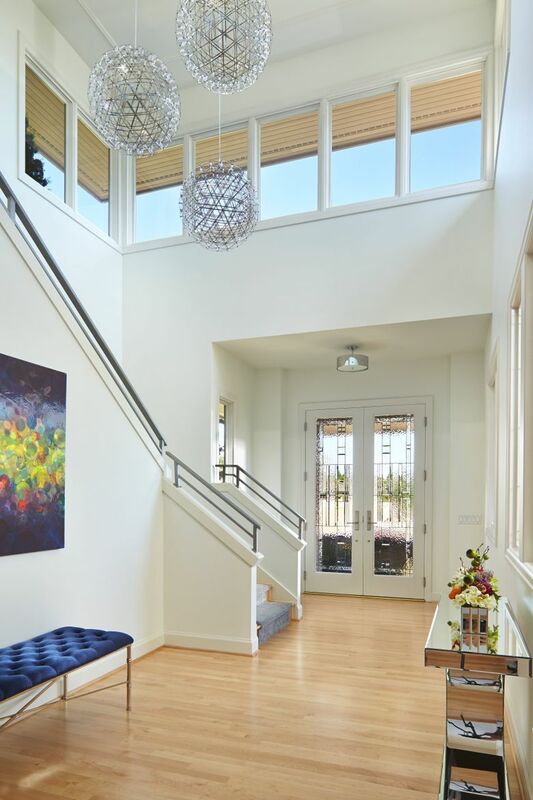 The couple loved the location — north end of Mercer Island, on a secluded street descending to the water — and liked the home, built in 1993, 5,400 square feet. It had good flow, fine bones, bright spaces, places for kids, places for grown-ups. But it was also full of brass and stainless steel; needed a cosmetic do-over. The couple hired contractor R.W. 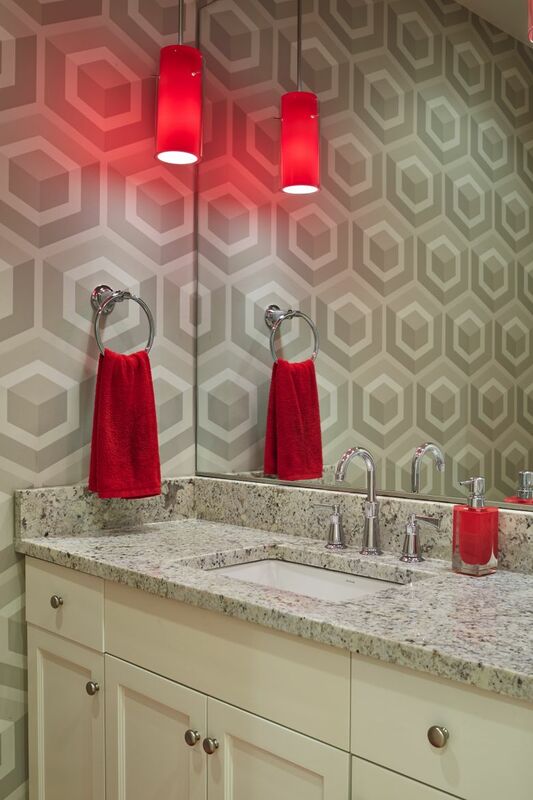 Anderson Homes for that, changing out counters, lighting, fixtures, stair railings and more. Cabinets, still serviceable, got new pulls. 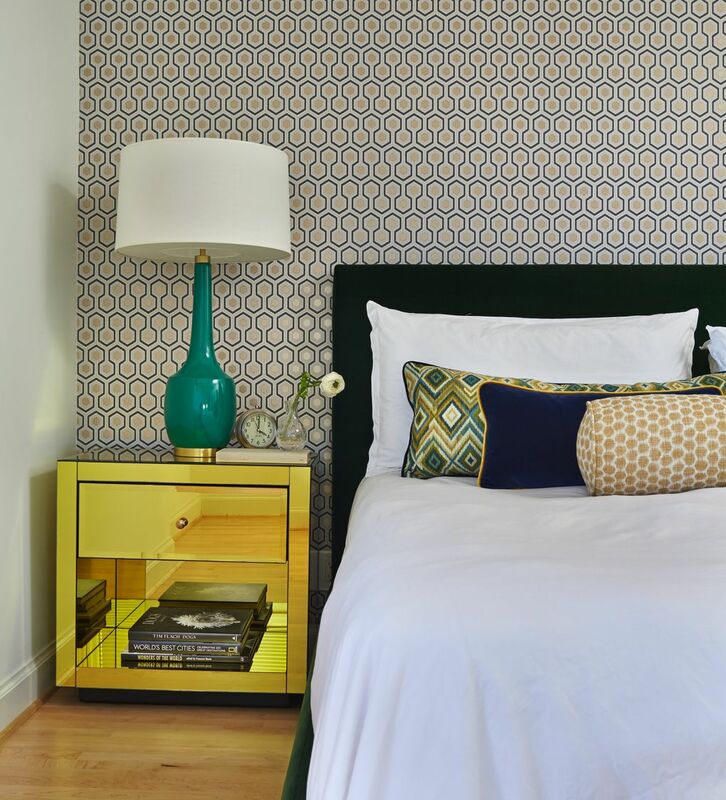 After that, for wall coverings, paint and furnishings, it was up to Gorsline of Kimberlee Marie Interior Design. “We were very lucky,” says Amanda. “Once we moved into this house, we were able to hit reset” (out with Ikea and college hand-me-downs). 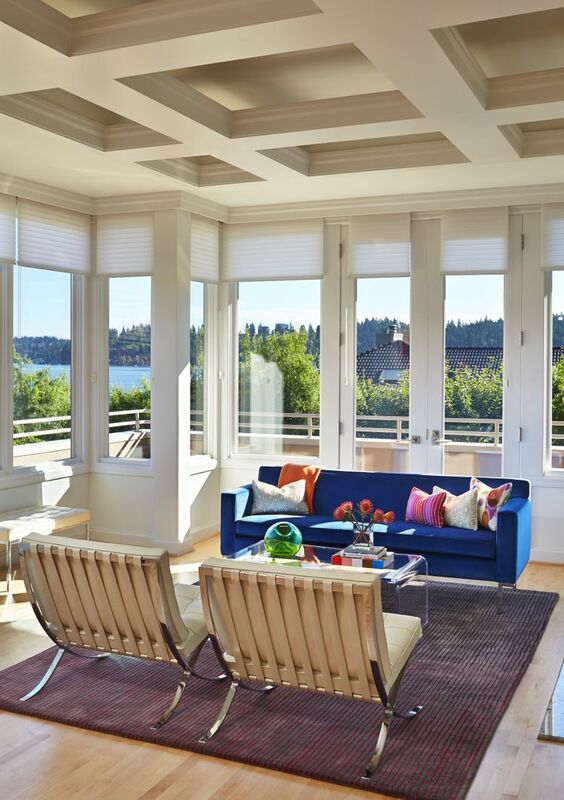 The living room, for example, is all about that lush royal blue sofa from Design Within Reach. A deepest violet table commands the dining room. Walls, like proper canvases, are stark white. Accompanying pieces are neutral, or in the case of the Philippe Starck Ghost Chairs in the dining room, invisible. 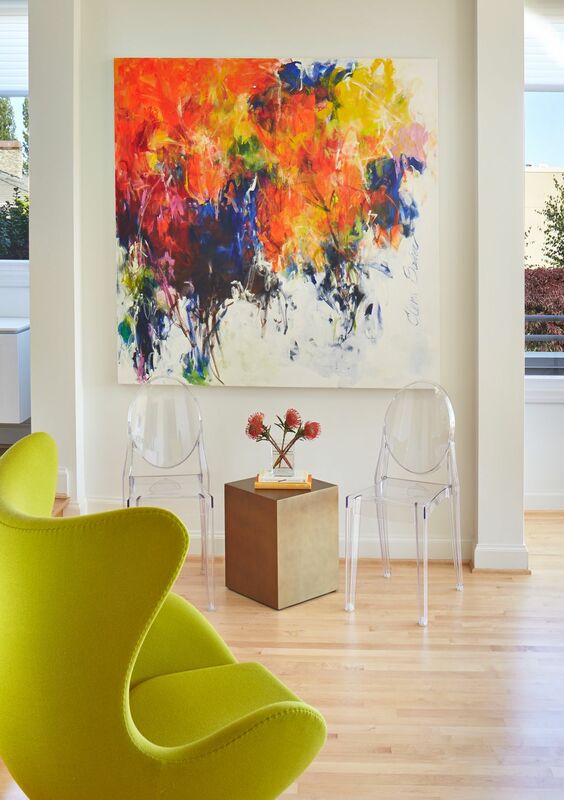 Amanda and Gorsline shopped for art, contemporary and most colorful, finding a large painting by Erin Parish at Winston Wächter Fine Art for the entry and another from Canadian artist Elena Baker for the living room. An Arne Jacobsen Egg Chair, in chartreuse, sits nearby. The effect everywhere is playful. Sophisticated. Work began in July 2014, and the family moved in that November. “I’m not someone who belabors decisions,” says Amanda. “We like and trust the people we hired. You can’t get mired in every choice. We spent a lot of time looking for tiles for the shower in the master bathroom. I found an example of what I wanted on Houzz, and Kim said, ‘OK, I’m on it.’ She found them at Ann Sacks. Mercer Island remodel. Interior design by Kim Gorsline.